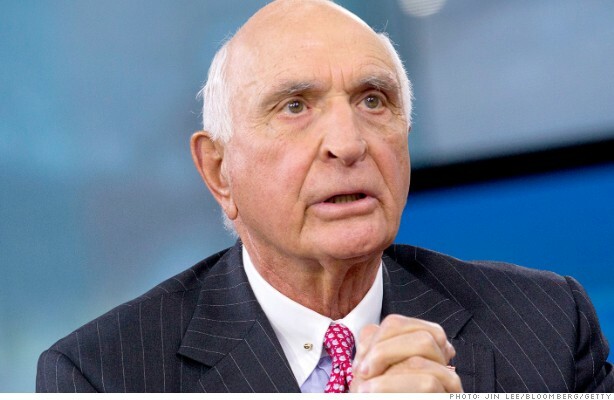 Billionaire Ken Langone had a few thoughts on regulation, among other things, at the SALT conference in Las Vegas Wednesday. He cited overly strict bank lending rules as the reason many young people can't get home loans, despite their good credit. Langone lamented that nowadays when he looks at a company or investment, he is forced to consider the impact of regulation. "I never did that before," he claimed. While Langone did admit that Wall Street was in many ways responsible for the financial crisis, he feels that regulation in the wake of the crash has gone to far. "We blew it by the excesses we allowed to happen, no doubt about it," he said, adding that the undoing of the Glass Stegall act in the late 1990s made the markets deregulated to a fault. However, "we're now at the highest point of regulation," he declared. On Spitzer, the former New York Governor who once tried to prosecute Langone for his role in formulating the severance package of the then head of the New York Stock Exchange, Langone didn't mince words. "I don't like him now, but if I can project how I feel when he dies, I'll probably feel better," Langone remarked. "There is a creature of regulation," he added. While it didn't seem like he had planned to take on the New York Times, Langone couldn't resist when alluding to an article he read in the paper recently. "Thank god it's dying, I don't like their politics," he swiped. As he's done in the past, Langone came to the defense of the wealthy. "You're in the 1%, there's nothing wrong with that," he told the audience of hedge fund managers and investors. "You can do so much more with money than pay your taxes." Still, Langone is optimistic about the future, and said the economy should be back at full steam in five to 10 years. And the best investment opportunities are right here in America, he believes. As for all that regulation, "we will fix it, it always happens that way," he predicted. Langone also gave a nod to his blue collar roots, and affirmed that success comes from hard work, not necessarily raw brain power. "The world is run by C students," he asserted. "There are a lot of geniuses out there, but there's a hell of a lot more dopes out there like me."